One thing about living in Melbourne is that you sometimes feel a bit silly heading out for Greek or Italian when you're interstate. We did sample a couple of the Apple Isle's offering of the latter, but on other occasions were left with just what was open in the town that night. Our plan had been to eat at Weindorfers, a restaurant attached to our accommodation, on the first night. It's only open for group bookings, however, but the proprietor was kind enough to recommend a Chinese restaurant in nearby Sheffield. We would have eaten there without the recommendation since I think it was the only place in town serving up, but it was good to know it had had good reports. It got good reports from me as soon as I stepped into the dining room. The restaurant is in a converted house and the dining area at the back defines 'bright', both in its lighting and decor. The menu kept things pretty simple: there were three meats on offer for mains and they came with something, usually a vegetable or a herb. Our picks were the garlic pork and the beef with sweet corn. We started with some vegie spring rolls, which came served on a sweet blue dish. The dough managed the happy duality of being both crispy and very oily and the cabbage, onion and carrot filling suitably flavoursome. The garlic pork preceded the beef dish by some minutes. While the amount of meat was undoubtedly generous, it was ably matched by the quantity of garlic laced through the dish! Not that there's anything wrong with that. From the taste samples I took while awaiting my beef dish I thought the meat had been well-handled, the vegetables were suitably crisp and the sauce was undoubtedly stocky, but worked well with the meat. I wasn't as convinced of the kitchen's merits by my beef and sweet corn. The sauce here took on more of a gelatinous texture, and there wasn't a lot to distinguish it from what had already been served with the pork. Again, however, the meat serving was sizable. It would want to be, however, since the dishes described plus rice for two (no drinks) came to a $50 meal! Most of the mains were priced at $17 or $18. We sourced a winning recommendation from our hostel to head to nearby La Calibrisella for dinner. We twinged momentarily at heading out to a good pizza joint while on holidays, since we live in rolling distance of a couple of the better ones in Melbourne, but this restaurant had an ultimately redeeming feature: it was BYO-only, charged no corkage and was across the road from a BWS! 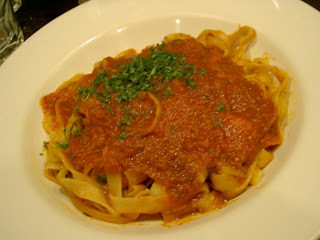 The menu was extensive Italian: a range of pastas as entree or main (with some thought to sauces), pizzas, and more substantial meat dishes (stuffed chicken breast, veal scallopine etc). 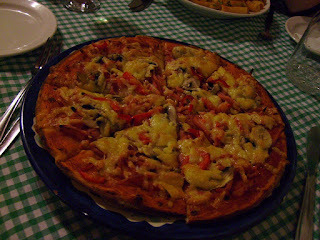 SG went with the inexplicably named 'surprise' pizza: the listed ham, capsicum and mushroom topping wasn't particularly unexpected, either on the menu or plate. The base smelled wonderful, as only freshly cooked dough can, but it was actually quite bready and a bit too sweet. 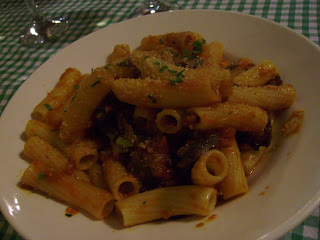 I chose the Penne Fontana, which, unlike the pizza, actually did come with some surprises. The menu promised hot salami, chilli and mushrooms. The dish arrived with capers and olives as well, so it was a welcome addition. It was properly hot and more enjoyable for the salty extras. 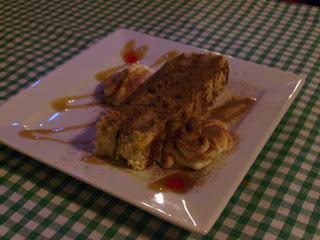 We shared a tiramisu for dessert, which was really more of an espresso sponge cake with a mascarpone layer than a traditional rendering of the dish, but the caramel sauce was a nice touch. The restaurant was well-patronised by locals, and the service was excellent. The last night should always be a special dining night. I'd spied an intimate-looking Spanish restaurant called Franciscos across from the famous Jackman and Ross bakery, but they'd decided to take Anzac Day off. Almost straight across the road was Da Angelo and when we went in at 8pm to find there were no tables until 9pm, we took it as a good sign. Clearly a local favourite, Da Angelo's was chocked with both diners and customers waiting to collect takeaway pizzas and pastas. They make all of their pasta on site, daily. This really came across in the moistness of the dough and its ability to absorb the sauce. What to order?? The menu offered spaghetti, fettucine and macaroni, each with their own half dozen sauces (though you're welcome to mix and match), plus three types each of ravioli, gnocchi and risotto plus veal and chicken dishes. Feeling our hunger enhanced by the Tasmanian beer we'd already consumed, we hastily ordered some garlic bread. 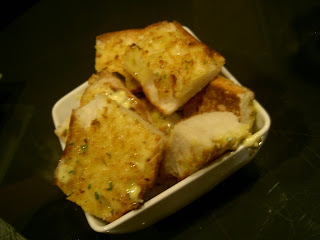 It came as grilled squares of fresh bread, actually dribbling with oil and butter and sprinkled with garlic pieces. I could have eaten several bowls of that and gone home happy. SG mixed his pasta and sauce, going with a heavy option of ravioli di carne with molisana sauce: bacon, onion, olives (first time he's ordered those! ), capsicum, tomato and garlic. 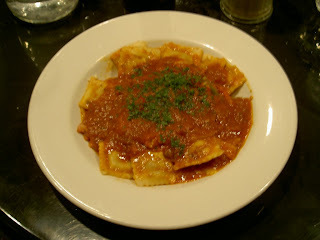 The ravioli was particularly fine, al dente in the way only freshly made specimens can be. Like me, however, there was no way he was going to do justice to the size of the portion. I needed assistance and decided to run with the waitress' recommendation of the fettucine matriciana (top tip: order entree size on the pastas!) It was hot! The sauce was well-balanced though, as the bacon contributed salty flavour to balance the sweeter tomato. I would have liked the red wine I'd ordered to be at hand to complement the sauce and temper the chilli, but our drinks were absent. One enquiry to a waitress elicited that 'they're probably on their way'. Even in a rammed restaurant, when the patrons' food is already at the table that's an insufficient answer. An enquiry to our original waitress revealed that she had in fact forgotten to order them. After tasting my wine I mustered courage to check with the manager as to whether I had actually received the Ninth Island (Tamar Valley) pinot I'd ordered, since the wine had all the aroma and earthiness of what I'd expect from the house cab sav. I was assured it was correct, but after the other issues I remained a little sceptical. It was a small downer to what was otherwise potentially a near perfect Last Night Out. Suffice to say that on the up side we were very happy (though distressingly over-supplied!) with our food.